We’d love your help. 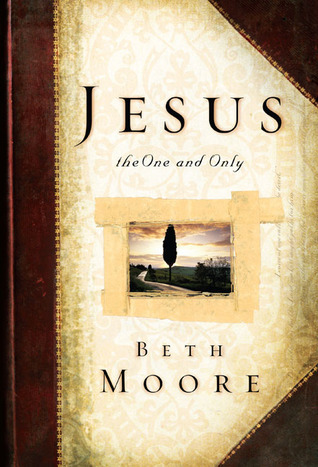 Let us know what’s wrong with this preview of Jesus, the One and Only by Beth Moore. In her previous books, Beth Moore has introduced her readers to David and Paul. In Jesus, the One and Only, Beth introduces them to an intimate Savior as they get a close-up and personal portrait of the life of Jesus the Messiah. But this is far more than just a work on the life of Christ. As He has done in the past, God uses Beth’s words to woo the reader into a romance wi In her previous books, Beth Moore has introduced her readers to David and Paul. In Jesus, the One and Only, Beth introduces them to an intimate Savior as they get a close-up and personal portrait of the life of Jesus the Messiah. To ask other readers questions about Jesus, the One and Only, please sign up. What did she want to accomplish? She states it on pg98. Not worth the time or effort to read it.Hope the study itself is better. It doesn't matter what Jesus looked like or the "breeze of the arid middle east". Really? I got this book as a "freebie" for my Kindle when the author offered it as a special promotion. I love when best-selling authors discount their books or better yet - offer them for free! I gladly would have paid for this book though. I thought the book was deeply insightful and I found myself slowly reading through each chapter so I could really chew on and digest the author's comments. I wanted to read through the many Scripture references as well and the author's writing style allowed me to li I got this book as a "freebie" for my Kindle when the author offered it as a special promotion. I love when best-selling authors discount their books or better yet - offer them for free! I gladly would have paid for this book though. I thought the book was deeply insightful and I found myself slowly reading through each chapter so I could really chew on and digest the author's comments. I wanted to read through the many Scripture references as well and the author's writing style allowed me to live them through her perspective. I realize there are many critics for author Beth Moore and many don't take her seriously as a theologian. I found her to be very knowledgeable and an excellent communicator. I like and appreciate Ms. Moore's "down-home" take on the Scriptures and found that she really helped me step into the life of Jesus and walk through the Scriptures with Him as if I was right there with Him. The author, Beth Moore, is a down to earth, unpretentious personable "gal." At no time does one feel that they are being "preached to." Although not pushy, Beth is a knowledgeable teacher. The book, as well as the complimentary video, is well documented with scripture and frequent references to original script and accurate translation. Her teaching relates well with the modern woman. One special highlight I learned from her study was the revelation of the power of God's original name ehyeh - tran The author, Beth Moore, is a down to earth, unpretentious personable "gal." At no time does one feel that they are being "preached to." Although not pushy, Beth is a knowledgeable teacher. The book, as well as the complimentary video, is well documented with scripture and frequent references to original script and accurate translation. Her teaching relates well with the modern woman. The simple words "I am" (God's own name for Himself as identified in Exodus 3:14), spoken with the authority of the one true God produced such power as to literally knock the men to the ground. How awesome is that? The compatible workbook to Jesus The One and Only was a bit tedious and at times felt silly & condescending. Given the need to meet the needs of a broad and diverse span of Bible students of all ages, one can be forgiving of the simplistic nature of the study guide. I started reading this book thinking it would be a serious study about the time period and the works concerning the topic. I was especially looking forward to etymological analysis (which I was led to believe from reviews was a key component of the book). Instead I found a personal interpretation of the Gospel of Luke, with an "imagine what so-and-so felt when" every other sentence. I'm sure it must be very inspirational for those looking for such things, but it's not for me I started reading this book thinking it would be a serious study about the time period and the works concerning the topic. I was especially looking forward to etymological analysis (which I was led to believe from reviews was a key component of the book). I love how Beth Moore makes one feel as if they are there in that moment with her additions to scripture understanding. Her studies and devotions always move my heart and strengthen my faith. This study took what I knew about Christ and raised it to another level of deeper understanding. I highly recommend it!!! I have little good to say about this book, unfortunately, written by a sister in the Lord. It is highly dumbed-down Christology, with oodles of [Myers-Briggs] ENFP, gushing conjecture about unnecessary details added to the biblical story, which are often dubious, and sometimes non-credible. Original language analysis was non-scholarly and superficial; it sounded like it was regurgitated right out of a concordance. Common knowledge abounds; you won't read almost anything novel (typically considered the reason for going to the trouble to publish a book in the first place). It is oddly denigrating to the disciples. Often oversimplified. A common phrase of Moore's begins, "I'm not sure, but...," and it isn't an, "I'm not sure..." in the humble, academic way which nevertheless contains competence. It is the "I'm not sure, but..." that you hear when one is about to hear a conspiracy theory or piece of unsubstantiated gossip. The only good things I remember are one small section about an Isaiah scroll, and perhaps some of the emotion conjectured about Jesus's death and resurrection in the end. Taking this as a very loose interpretation that doesn't seem well-researched, this isn't a terrible book. This is probably my favorite of anything written by Moore, but that's honestly not saying much. It was interesting to read, and would add dynamic if reading concurrently with the gospel of Luke. I absolutely would not recommend this as a standalone without extensive prior knowledge of the gospels (all four of them). Second best to hearing Beth Moore speak, is reading her words. I read this in 2006, and really began to see more clear what Christ did for us much more preciously after reading this book. I learned so much, because Beth is rich in History and background. My biggest 'want' from an author is, did they do research? All of Beth Moore's books have so much of her heart in them, her love for the Word, and for Christ. Awesome book! I loved how Beth Moore made the amazing journey of Jesus's life here on earth so easy to understand. I felt she was sitting in a room with me explaining all over coffee. I laughed,cried,felt deep emotional pain,and even forgiveness. " yes Jesus loves me,the bible and (Beth) tell me so"
I have so much I want to read, that I have several books going at once. At beginning of each chapter there is a passage of scripture....so our comes my BIBLE....then read the chapter. For more clarity out comes one or both of my BIBLE Handbook and I read more in the Book of Luke. An Intimate Look at Jesus from birth until His resurrection. Obviously she couldn't cover everything, but she takes significant happenings throughout His life on earth and expounds on them. I think this book is more effective if you read and talk about it with someone else. This was a helpful companion while I was studying the book of Luke. About The Book: In her previous books, Beth Moore has introduced her readers to David and Paul. In Jesus, the One and Only, Beth introduces them to an intimate Savior as they get a close-up and personal portrait of the life of Jesus the Messiah.But this is far more than just a work on the life of Christ. As He has done in the past, God uses Beth’s words to woo the reader into a romance with the One and Only. The reader comes to know Christ personally, watching and listening as He breaks up a fun About The Book: In her previous books, Beth Moore has introduced her readers to David and Paul. In Jesus, the One and Only, Beth introduces them to an intimate Savior as they get a close-up and personal portrait of the life of Jesus the Messiah.But this is far more than just a work on the life of Christ. As He has done in the past, God uses Beth’s words to woo the reader into a romance with the One and Only. The reader comes to know Christ personally, watching and listening as He breaks up a funeral by raising the dead, confronts conniving religious leaders of His day, teaches on a Galilean hillside, or walks on the waves and calms the storm. About The Author: "Known for presenting Scripture in living color, Christian speaker and Bible study author Beth Moore enjoys getting to serve women of every age and denomination, and she is passionate about women knowing and loving the Word of God. Beth's broad collection of LifeWay women Bible studies covers relevant topics from believing God to be Who He says He is to loving difficult people. Each in-depth study guides you on your faith journey. Beth and husband Keith praise God for over 30 years of marriage. They enjoy traveling, hiking, drinking coffee on the back porch, eating Mexican food, making each other laugh, walking their dogs, and being grandparents." My Thoughts On The Book: How can I tell you in just a few short words how Beth Moore inspires me with every single book I have read or bible study I have participated in? I will be honest and say it is impossible. Yet, within the pages of this particular book author, Beth Moore touches me once more as she takes her reader on a personal journey sharing just how to know Jesus personally. The book is divided into 10 different sections with 53 chapters. Each chapter begins with a Bible verse and focuses on a different aspect of Christ and how we should apply that particular theme to our lives personally. I am a huge Beth Moore fan and this book does not disappoint. As with all of her other books this book was well written and inspiring. I could not get enough of the message each nugget held for me. The book was an adventure that I want to take to be wrapped up in Jesus’ unconditional love. When Beth Moore shares Jesus with you it is an intimate relationship that she offers you. She knows her Jesus….personally. Jesus the One and Only takes one on a journey - a journey of the life of Jesus as seen through the eyes of Luke. Luke is unique in his perspective in that he was the only Gentile Gospel writer, he was inspired by God to write this account. Where the other writers assume the reader is familiar with the culture of the day, Luke focuses on the Jewishness of Christ and the culture in which He lived. Through Luke we see how Jesus was and is the fulfillment of Jewish law and God's promises to humanity. We see Jesus experiencing the human experience living as an ordinary average person. Just as Jesus asked questions, as a child in the Temple, we too should ask questions so that we may come to a greater understanding of God. Only by seeking answers can our faith grow. But asking isn't enough, we must also listen to the answers. Growth and understanding are not instantaneous and it may take time to understand the answers and how they apply to us. We see through the temptations of Jesus that temptation is not a sign of God's displeasure. When facing temptation don't fight with your words instead do as Jesus did and fight Satan with God's Word. Through Luke's Gospel we learn that no one goes unnoticed by Christ. Studying the Bible is proof that we are the family of God. The scars of the Crucifixion are a testament of this notice and love that Jesus has for us. Jesus the One and Only has 53 chapters that cover select verses in the Gospel of Luke, every single verse is not discussed, but this in no way detracts from this study. This study is perfect for the individual or in a group setting. This book will help you to actively engage with God's message and not just sit on the side and watch. We need to seek out seek out God and this book will give you a good starting point to change your life and to become more effective in your daily relationship with Him. I was provided a copy of this book through Shelton Interactive in exchange for my honest review. “Jesus, the One and Only” is an invitation to know Christ personally. Beth Moore, writer and teacher of best-selling books and Bible studies, uses the book of Luke as her guide as she leads readers through a study that will open your eyes to the life and character of our Lord and Savior Jesus Christ. This book complements Moore’s “Jesus, the One and Only” Bible study but can also be read separately. Beginning with the story of John the Baptist and ending with the ascension after the death and res “Jesus, the One and Only” is an invitation to know Christ personally. Beth Moore, writer and teacher of best-selling books and Bible studies, uses the book of Luke as her guide as she leads readers through a study that will open your eyes to the life and character of our Lord and Savior Jesus Christ. This book complements Moore’s “Jesus, the One and Only” Bible study but can also be read separately. Beginning with the story of John the Baptist and ending with the ascension after the death and resurrection of Christ, Moore uses her talent of teaching the Word to present truths about Jesus that will help you understand His teachings so you can apply them to your life. Moore takes a biblical approach but does take some liberty in imagining what would have been going on which some may find off-putting. However, she does let the reader know when her imagination takes over. I enjoy these little diversions as she shows us the culture of the time and what Jesus might have been doing and what others were thinking as He taught and preached. This book will enhance a study of Christ and will lead to a better understanding of the time period He lived in and why people reacted the way they did. This book is about what the title says it's about. Jesus. The one and only. Except read that title with a catch in your throat and tears in your eyes. You'll be closer to the truth. This isn't a book for intellectuals. It's a bible study for seeking hearts. I made the mistake of trying to read through it at first. Don't do that. It isn't a read through book. It's a study in Luke of Jesus. Read and meditate on the biblical passages straight from the word alongside the book to experience it proper This book is about what the title says it's about. Jesus. The one and only. Except read that title with a catch in your throat and tears in your eyes. You'll be closer to the truth. This isn't a book for intellectuals. It's a bible study for seeking hearts. I made the mistake of trying to read through it at first. Don't do that. It isn't a read through book. It's a study in Luke of Jesus. Read and meditate on the biblical passages straight from the word alongside the book to experience it properly, to "walk where he walked," as Beth says. It isn't a book about knowing more about Jesus. It's a book meant to open a way to love him more. Loved this study of the Gospel of Luke. Beth Moore has an incredible gift of digging deep into the Scripture and making it relate to my day to day walk with Jesus. I saved the chapter about Jesus' trials, suffering and crucifixion for Good Friday. Oh how glorious my Good Friday was this year as I read through all four Gospel accounts along with Beth's insight. Experiencing Jesus love for me as I meditated on His willingness to suffer so greatly for me! He bore my sin and received the wrath of Go Loved this study of the Gospel of Luke. Beth Moore has an incredible gift of digging deep into the Scripture and making it relate to my day to day walk with Jesus. I saved the chapter about Jesus' trials, suffering and crucifixion for Good Friday. Oh how glorious my Good Friday was this year as I read through all four Gospel accounts along with Beth's insight. Experiencing Jesus love for me as I meditated on His willingness to suffer so greatly for me! He bore my sin and received the wrath of God that I deserved so that I could receive grace, mercy and eternal life. Then to read on Easter Sunday, the account of His resurrection with new eyes. Beth gives a freshness to the Scriptures that made it feel like I was reading them for the first time. God has truly blessed her with a beautiful gift that I am thankful to have experienced. The author takes you on a personal journey with her as she explores how to know Jesus personally. The book is broken up into 10 different sections with 53 chapters. Each chapter begins with a Bible verse and focuses on a different aspect of Christ and how to apply that to our lives personally. The author's approach is on a personal level instead of a more scholarly level. The book was well written and inspiring. It is a large book, but the personal aspect of it helps the reading to go by quickl The author takes you on a personal journey with her as she explores how to know Jesus personally. The book is broken up into 10 different sections with 53 chapters. Each chapter begins with a Bible verse and focuses on a different aspect of Christ and how to apply that to our lives personally. The author's approach is on a personal level instead of a more scholarly level. The book was well written and inspiring. It is a large book, but the personal aspect of it helps the reading to go by quickly. If the time is taken to absorb each thought, the book will be an encouraging and enlightening experience. My only complaint is a personal one. There are books that click, that the author somehow speaks my language. This was not that book. I enjoyed the message, but the writing just never spoke to me. But as I mentioned, this is a personal thing and not really against the book. This book was lent to me about a year ago and I was always feeling guilty of not reading it. Beth Moore takes the reader through the gospel of Luke. She goes into several fictional what if's in the book that is acceptable and entertaining but not that edifying. Overall the book is faithful to the text. It might be a recommended read for women; however, I would rate her slightly higher than This book was lent to me about a year ago and I was always feeling guilty of not reading it. Beth Moore takes the reader through the gospel of Luke. This was my first book by Beth Moore, not sure why it took so long, but it won't be my last. Beth covers the Gospel of Luke in a warm simple fashion bringing each chapter alive as she pushes us to not just study this Gospel story but to become part of it. This study on the book of Luke is the first book I've read by Moore. I thought she did a good job. Her writing style is simple and accessible. Although she didn't cover all events in Luke the reader definitely comes away with a better understanding of Luke's gospel. My one criticism is that her writing style is very informal. If I had been the editor I would have tightened a lot of that up :) overall a wonderful devotional book. Read this because a visiting pastor highly recommended it. The writing style wasn't for me - too much "gushing" and familiarity in her style. That said, she does have a talent for making the story come alive and made some interesting and helpful observations. Overall, not a book I would recommend to others. This book sought to emote the story of Jesus, and I thought it accomplished its goal pretty well. Beth Moore's commentary can be a little wearisome, and I can take or leave most of it ("I can almost imagine Jesus thinking..." "I like to imagine the disciples felt..." etc. ), but there were enough moments of lucid exegesis that made this book well worth reading in small doses. I actually had not read anything by Beth Moore, but I had heard so much about her Bible studies, etc. I will post meaningful passages later. I loved the insight she provided to the Gospels. My dear friends Megan and Emilie did this as a Bible Study with audio. This is not one to miss! There is nothing more inspiring than reading about the life of Jesus Christ, and Beth Moore does a great job presenting this topic.